This is a global employee survey diagram ppt background images. This is a five stage process. The stages in this process are attract, induct, develop, cognitive, emotional. 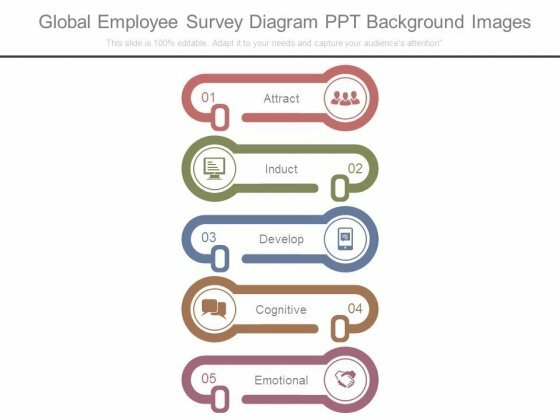 Our Global Employee Survey Diagram Ppt Background Images team cater for all possibilities. You thoughts will automatically factor all in. This is a client acquisition model diagram presentation visual aids. This is a four stage process. The stages in this process are public relations, campaign, attract, convert. Deal with matters in an equitable way. 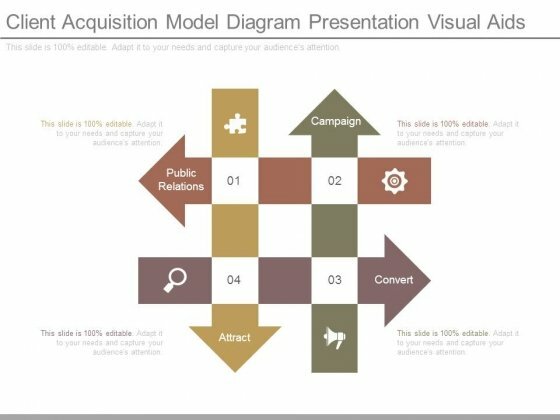 Reach a settlement with the help of our Client Acquisition Model Diagram Presentation Visual Aids. 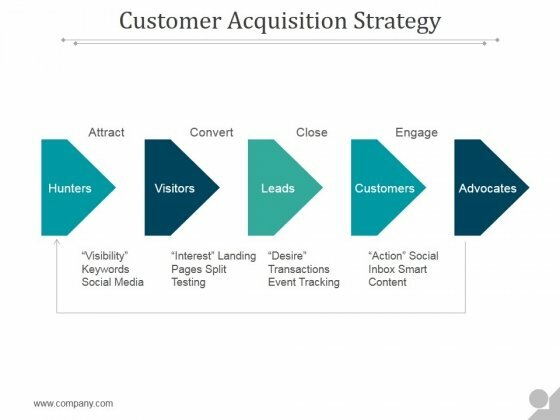 This is a arrow steps for customer acquisition powerpoint slide. This is a five stage process. The stages in this process are hunters, visitors, leads, customers, advocates, engage, close, convert, attract. 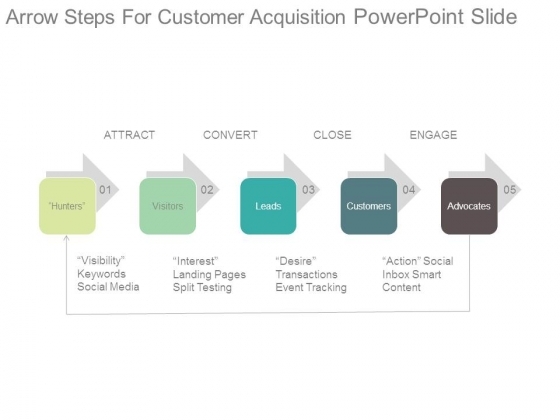 Suggest ideas with our Arrow Steps For Customer Acquisition Powerpoint Slide. Download without worries with our money back guaranteee. This is a customer loyalty circle chart powerpoint slide templates download. This is a six stage process. The stages in this process are grow, engage, attract, reward, retain, loyalty. Thwart problems with our Customer Loyalty Circle Chart Powerpoint Slide Templates Download. Download without worries with our money back guaranteee. This is a customer acquisition strategy ppt ideas ppt ideas. This is a five stage process. The stages in this process are attract, convert, close, engage, hunters, visitors, leads, customers, advocates. Chew on important pieces of information with our Customer Acquisition Strategy Ppt Ideas Ppt Ideas. You will come out on top. 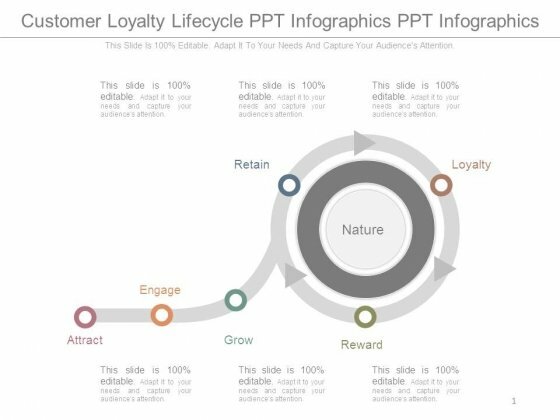 This is a customer loyalty lifecycle ppt infographics ppt infographics. This is a six stage process. The stages in this process are retain, loyalty, nature, engage, attract, grow, reward. Choke confusion and bring clarity with our Customer Loyalty Lifecycle Ppt Infographics Ppt Infographics. You will come out on top. 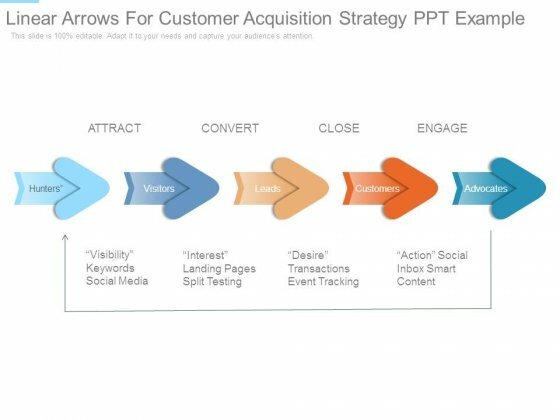 This is a linear arrows for customer acquisition strategy ppt example. This is a five stage process. The stages in this process are attract, convert, close, engage, hunters, visitors, leads, customers, advocates, visibility keywords social media, interest landing pages split testing, desire transactions event tracking, action social inbox smart content. Our Linear Arrows For Customer Acquisition Strategy Ppt Example make it a cakewalk. You will dominate the event with authority. 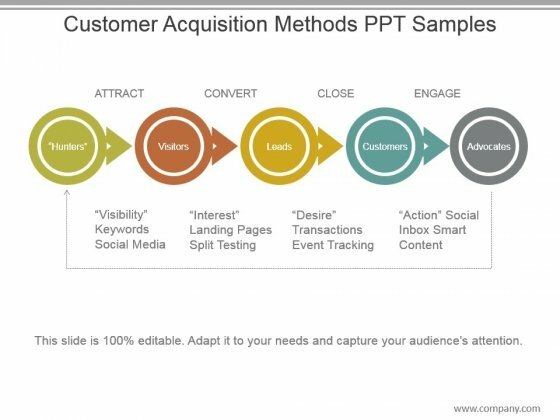 This is a customer acquisition methods ppt samples. This is a four stage process. The stages in this process are attract, convert, close, engage, hunters, visitors, leads, customers, advocates, visibility keywords social media, interest landing pages split testing, desire transactions event tracking, action social inbox smart content. Ecology is a common concern. Express your beliefs with our Customer Acquisition Methods Ppt Samples. 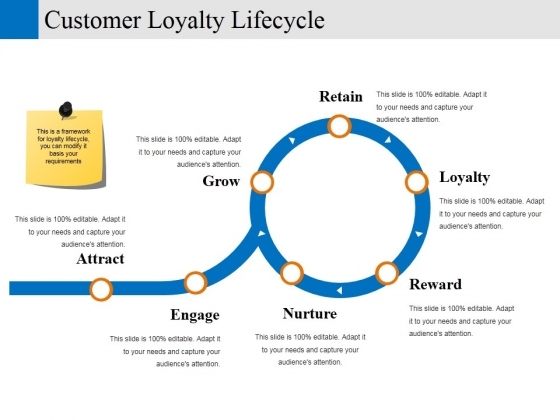 This is a customer loyalty lifecycle ppt powerpoint presentation slide download. This is a six stage process. The stages in this process are attract, engage, reward, grow, retain. Give our Customer Loyalty Lifecycle Ppt PowerPoint Presentation Slide Download catalogue a good look through. You will be enthralled by their appeal. 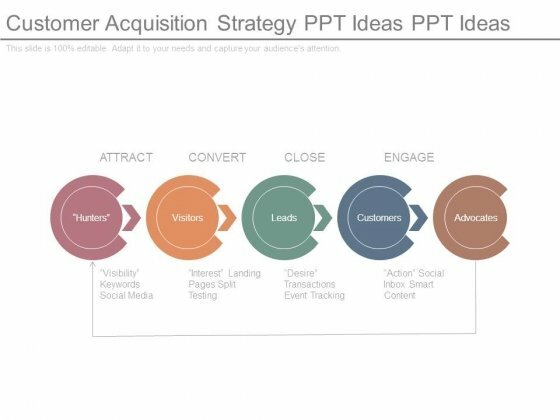 This is a customer acquisition strategy ppt powerpoint presentation introduction. This is a five stage process. The stages in this process are attract, convert, close, engage. Make our Customer Acquisition Strategy Ppt PowerPoint Presentation Introduction your calling card. Your thoughts will find open doors. 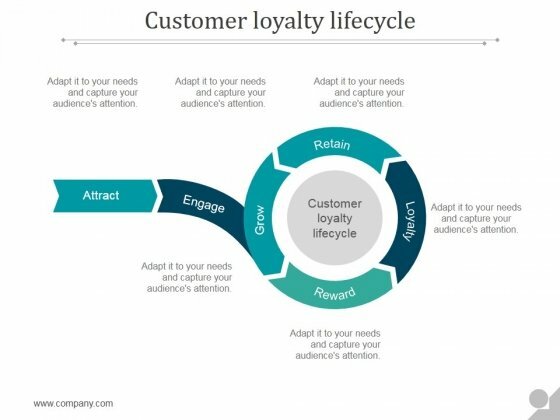 This is a customer loyalty lifecycle ppt powerpoint presentation infographics icons. This is a seven stage process. The stages in this process are attract, loyalty, engage, retain, reward. Get folks involved in intellectual interactions with our Customer Loyalty Lifecycle Ppt PowerPoint Presentation Infographics Icons. Keep them away from being lowbrow. 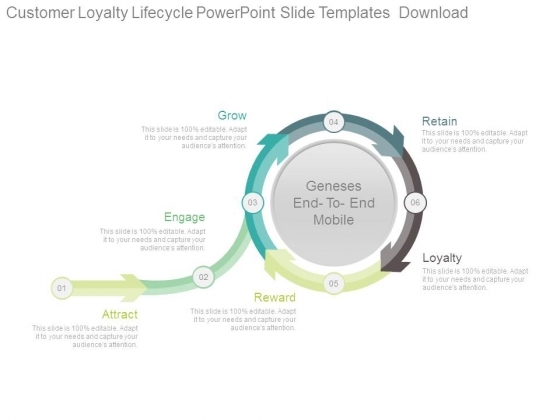 This is a customer loyalty lifecycle ppt powerpoint presentation show aids. This is a seven stage process. The stages in this process are attract, engage, nurture, reward, grow. Folks earnestly follow you due to our customer loyalty lifecycle ppt powerpoint presentation show aids. It begets loyalty. 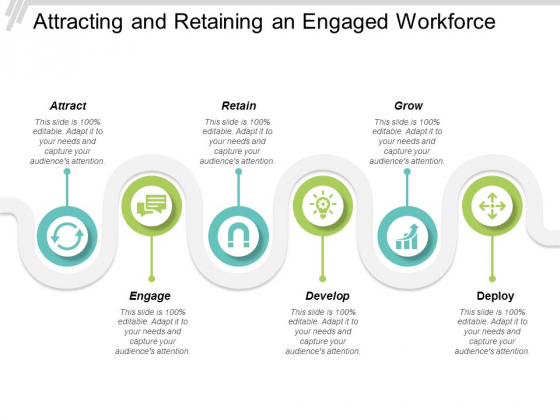 This is a attracting and retaining an engaged workforce ppt powerpoint presentation model display. This is a six stage process. 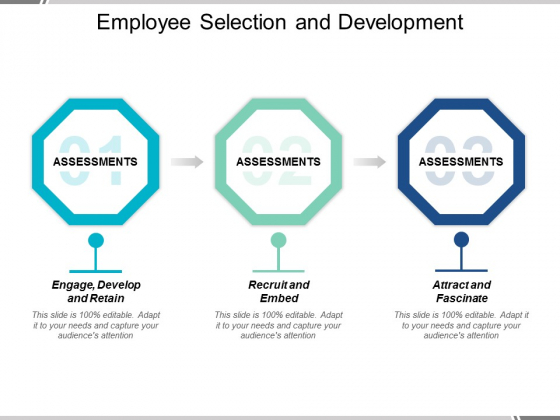 The stages in this process are attract, hr, human resource management, retain and engage. 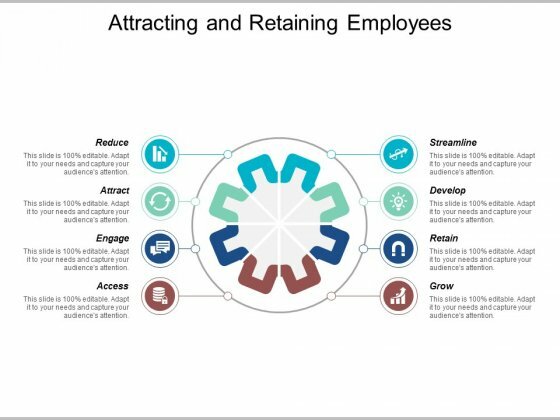 Bolster loyal individuals with our Attracting And Retaining An Engaged Workforce Ppt Powerpoint Presentation Model Display. Increase the level of faith in the country. This is a attracting and retaining employees ppt powerpoint presentation file slide portrait. This is a eight stage process. The stages in this process are attract, hr, human resource management, retain and engage. Increase the level of faith in the country with our Attracting And Retaining Employees Ppt Powerpoint Presentation File Slide Portrait. Bolster loyal individuals. 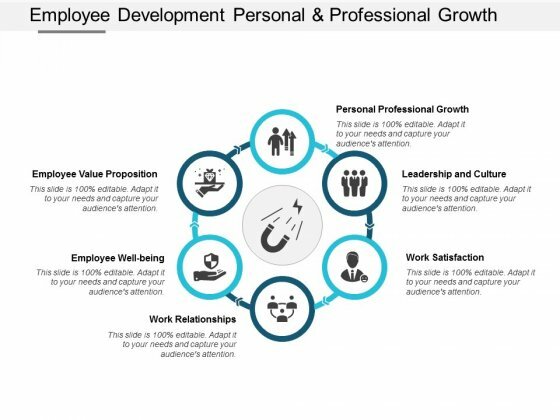 This is a employee development personal and professional growth ppt powerpoint presentation file format ideas. This is a six stage process. The stages in this process are attract, hr, human resource management, retain and engage. Folks choose to be loyal due to our Employee Development Personal And Professional Growth Ppt Powerpoint Presentation File Format Ideas. They like displaying commitment. This is a employee engagement vector icon ppt powerpoint presentation file model. This is a four stage process. The stages in this process are attract, hr, human resource management, retain and engage. Folks like displaying commitment due to our Employee Engagement Vector Icon Ppt Powerpoint Presentation File Model. They choose to be loyal. 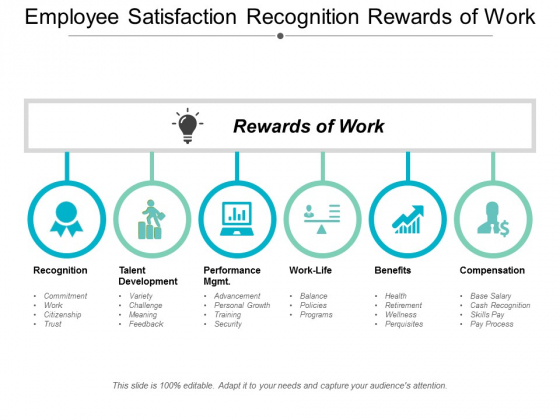 This is a employee satisfaction recognition rewards of work ppt powerpoint presentation outline layout ideas. This is a six stage process. The stages in this process are attract, hr, human resource management, retain and engage. Elect loyal individuals due to our Employee Satisfaction Recognition Rewards Of Work Ppt Powerpoint Presentation Outline Layout Ideas. Ensure the country is led by committed folk. This is a employee selection and development ppt powerpoint presentation show gallery. This is a three stage process. The stages in this process are attract, hr, human resource management, retain and engage. Ensure the country is led by committed folk with our Employee Selection And Development Ppt Powerpoint Presentation Show Gallery. Be able to elect loyal individuals. 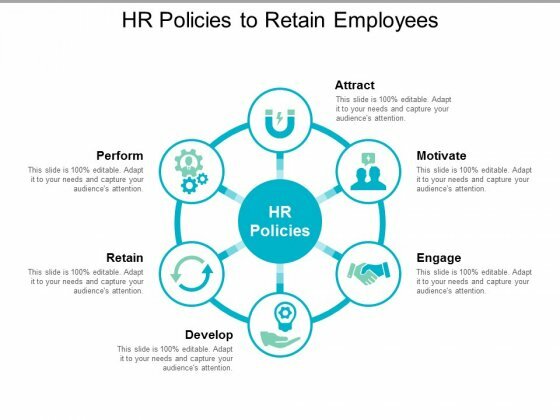 This is a hr policies to retain employees ppt powerpoint presentation inspiration deck. This is a six stage process. The stages in this process are attract, hr, human resource management, retain and engage. Bring loyal individuals to the fore with our Hr Policies To Retain Employees Ppt Powerpoint Presentation Inspiration Deck. Ensure committed folk become known to all. 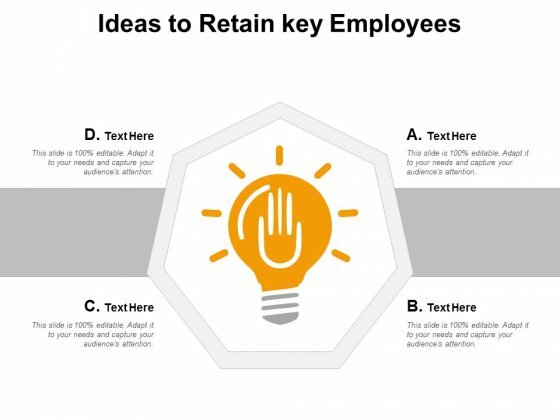 This is a ideas to retain key employees ppt powerpoint presentation styles model. This is a four stage process. The stages in this process are attract, hr, human resource management, retain and engage. Ensure committed folk become known with our Ideas To Retain Key Employees Ppt Powerpoint Presentation Styles Model. Bring loyal individuals to the fore. 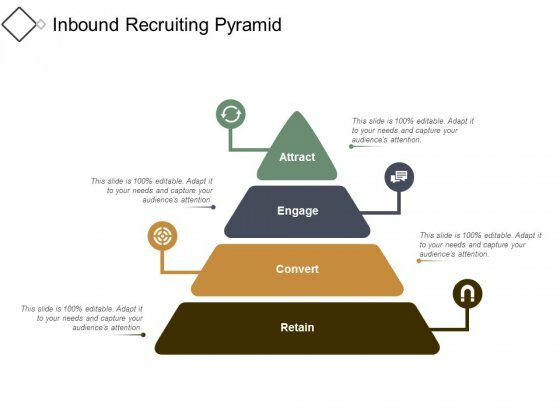 This is a inbound recruiting pyramid ppt powerpoint presentation show template. This is a four stage process. The stages in this process are attract, hr, human resource management, retain and engage. Ensure committed individuals get elected with our Inbound Recruiting Pyramid Ppt Powerpoint Presentation Show Template. Campaign for loyal folk. This is a retention vector icon ppt powerpoint presentation model pictures. This is a three stage process. The stages in this process are attract, hr, human resource management, retain and engage. Insist on choosing committed individuals with our Retention Vector Icon Ppt Powerpoint Presentation Model Pictures. Ensure election of loyal folk. 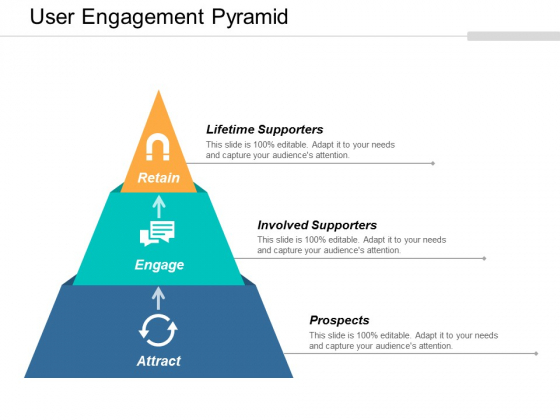 This is a user engagement pyramid ppt powerpoint presentation professional mockup. This is a three stage process. The stages in this process are attract, hr, human resource management, retain and engage. Get folks aware of committed individuals with our User Engagement Pyramid Ppt Powerpoint Presentation Professional Mockup. It helps introduce loyal candidates. 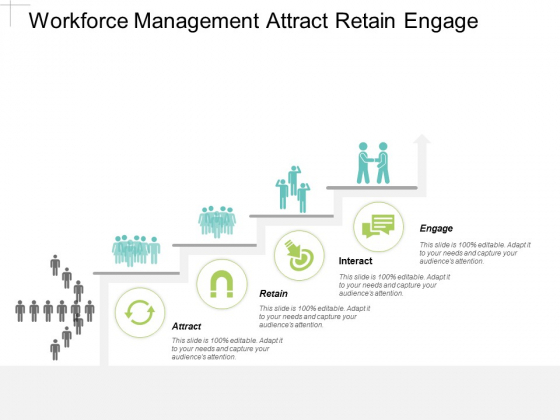 This is a workforce management attract retain engage ppt powerpoint presentation summary model. This is a four stage process. The stages in this process are attract, hr, human resource management, retain and engage. Increase the chances of loyal individuals with our Workforce Management Attract Retain Engage Ppt Powerpoint Presentation Summary Model. Back committed candidates.